Syndicated from the UCONN EM Residency website; credit to Dr. Russell and Dr. Kleinberg for cases and images. HPI: 59 yo male with PMH poorly controlled diabetes presents with painless vision loss in the right eye. Patient initially noticed blurry vision in the periphery of his right eye for the past week and an increase in the number of floaters in the eye. Today it was almost like a black curtain was coming down in the eye so he came to the ED for an evaluation. He denies any history of trauma, redness or foreign body sensation. SH: Smokes 1ppd for the past 40 years, no IVDU or alcohol use. PE: Afebrile, VSS. Eyes: EOMI, PERRLA, no evidence of globe trauma. Fundoscopic exam: no obvious abnormality. Visual acuity: patient not able to see light or moving objects in right eye, left 20/50. Intraocular pressure, 15 bilaterally. Visual fields: not able to see out of right eye, normal in left eye. SLE: anterior chamber appears normal, no foreign bodies or corneal ulcerations appreciated. Bedside U/S (see beginning of post for 1st still image): click for video. I recently read this article published by Time Magazine regarding the recent moves by some politicians to attempt to penalize citizens for using our country’s ED’s for what the deem “inappropriate usage.” The article brings up a number of good points, and I suggest you all to give it a read. For my two cents, it seems entirely hypocritical to throw blame for our nation’s health care costs at the feet of the very safety network keeping this tenuous house of cards upright. The article makes an excellent point that while many cases seen in the ED end up being diagnosed as “non-emergent,” hind-sight is 20-20. To our patients, their condition is an emergency, and that is why they have come to us for care. They are often scared and have no one to turn to for help. The politicians mentioned herein seem annoyed at the simple idea that emergency physicians are doing their job; treating patients who present with acute and emergent illness, reassuring those who do not, and exercising their ability to tell the difference. I arrived at the ED at 5 pm for my first 8-hour shift of the elective. It was relatively quiet, I thought. I attributed this to the snow—it started to come down in earnest around 7pm. By 10pm it was, as my dad has always called these blizzards, a white out. I had no concerns in the world. Perhaps something cool will come in, I hoped. The receiver crackled on—just like an old radio my grandparents have. My attending’s smile softened; my glazed-over face peaked with excitement. “Get room 1 ready–fast” my attending murmured to the charge nurse. She looked at me and told me to grab 2 liters of normal saline, tubing, blankets, and a few other things that I immediately forgot. The department was instantly buzzing. Nurses were shuffling patients from one area to another to clear Room 1. My attending was huddled around the emergency receiver with another ED attending. Through the commotion, I could not hear what was being said; but I knew the doctors were anxious. The emergency doors swooshed open; the muffled howl of the winds crescendoed and then reached their cadence as a swarm of EMS officers rushed in, wheeling a stretcher. They were bagging the patient; she was intubated en route, I overheard. “Get her in room 1 and on the monitors, STAT!” shouted my attending. I had completely forgotten my meager task. I ran to the store room, but it was locked. I turned around and ran back to the nursing station. A friendly PA escorted me to the storeroom and got me the saline and tubing. I hustled over to room 1, spiked the bags, and hung them. I was proud of my minor contribution. I had learned how to spike bags in my hospital job last year. Then I turned around; my heart skipped a beat. One! Two! Three! Four! Five! Get those compressions up to 100 bpm! I was frozen. With each compression I could see the patient’s body heave. Analyzing rhythm. Shock advised, droned the AED. “Everyone clear! ?” shouted my attending. “Clear!” came the response in unison. Her body bucked off the hospital bed and landed with a thump. Check for pulse. If no pulse detected resume CPR. She was in ventricular fibrillation. “Resume compressions” said my attending. “Your turn” shouted the scrub nurse. She was looking at me. Summary for “Prospective, Double-Blind, Randomized, Placebo-Controlled Comparison of Acetazolamide Versus Ibuprofen for Prophylaxis Against High Altitude Headache: The Headache Evaluation at Altitude Trial (HEAT) by Jeffery Gertsch, MD, et al. in Wilderness and Environmental Medicine vol 21 pp: 236-243. Headaches are one of the most common complaints from those who venture into high altitudes. Termed High Altitude Headaches (HAH), these can occur as benign incidents but are also considered a sentinel symptom of the development of Acute Mountain Sickness (AMS). AMS is defined at altitudes above 2500m with the presence of headache and one other symptom (anorexia, fatigue, insomnia, or dizziness). Left untreated, AMS can lead to High Altitude Cerebral Edema (HACE) which is associated with a significant mortality rate. Ibuprofen was widely been used in the treatment of HAH through its inhibition of the inflammatory pathway. Acetazolamide, a diuretic and carbonic anhydrase inhibitor, has also been documented in the prevention of altitude headaches. The mechanisms of AMS prevention include renally induced metabolic acidosis resulting in diuresis and increased ventilation and inhibition of CSF production. Despite the frequency with which HAH occur, there is a relative lack of literature pertaining to its prevention. This study was designed to compare the effects of treatment with ibuprofen with acetazolamide while also better establishing clinical standards for HAH prevention. This study was a prospective, double-blind, randomized, placebo-controlled trial. Both ibuprofen and acetazolamide proved effective in the prevention of HAH and can be recommended for prophylaxis at altitude with the inference that acetazolamide may prevent more severe headaches. The clinical efficacy of low-dose acetazolamide in the prevention of AMS has been reconfirmed and ibuprofen was also found to be effective against symptoms of AMS. The use of these drugs in high altitude situations may help lower the incidence of AMS and thus prevent the onset of HACE and decrease the incidence of HACE-related mortality. Would other NSAIDs provide the same or similar protection? Is the action of ibuprofen simply masking the pain of a true underlying HAH? The participants were already at a high altitude before they began the study. What then, would be the effect of ibuprofen and acetazolamide on people going from low altitude to high. Are these drugs really preventing HAPE/HACE or are they simply preventing one of the symptoms? Syndicated from the UCONN EM Residency website; credit to Dr. Ratzan for images and text. The following patient presented with swelling of the tongue for several hours duration without any dyspnea. She had never had this before. She had a past medical history of hypertension, CHF, hypothyroidism, rheumatoid arthritis, diabetes mellitus, dementia and was on synthroid, lisinopril and glucophage. Physical examination was negative except for the massively edematous tongue. No stridor and normal breath sounds. EKG and O2 sats were normal. ECG’s are a routine procedure commonly encountered in the Emergency Department and integral to the diagnosis and disposition of a wide variety of patients. The two most important factors in the usefulness of an ECG are its quality and the duration of time it takes to be performed. A poorly done ECG done promptly can be just as useless as a well-done ECG received too late. Therefore, improvements in the speed and quality of ECG recording are highly sought after. The quality and promptness of an ECG are heavily influenced by the user. It is not uncommon for errors to occur in the placement of ECG leads, in particular reversal of the leads. These types of mistakes can lead to a significant loss in time and accuracy of interpretation of ECG’s. Unfortunately, these types of errors are more common in the acute settings, such as those often seen in Emergency Departments. This study involved the use of pre-wired electrodes, rather than conventional electrodes that are placed and then hooked up to the series of wires. These prewired electrodes are disposable, pre-wired, pre-gelled, and numbered for ease and elimination of ambiguity in placement. Is there a difference in the quality of ECG recordings obtained with conventional versus prewired electrodes ? How easy is the use of the prewired electrodes in an emergency setting? Prospective, randomized, open comparison study including 105 patients undergoing ECG’s. Time to make recordings was measured, and both a prewired and conventional recording was performed. These were then analyzed and scored by 3 blinded reviewers, on the basis of artifacts and baseline instability. The ECG’s performed with the prewired electrodes took 20% less time than those done with conventional electrodes (average 118 seconds versus 144 seconds). Signal noise and baseline instability were significantly reduced with prewired electrodes regardless of the endpoint considered (whether number of unstable leads, max signal noise, baseline instability score, etc). There was no significant difference found in the prevalence of p-wave or QRS complex abnormalities. The recordings done with prewired electrodes were accomplished significantly faster than those with conventional – and this did not include the time necessary to disinfect and untangle the lead wires (a daunting task, at times). In addition, recordings with prewired electrodes were significantly better than those made with conventional electrodes. The number of artifact-free recordings was nearly twice as high, and the level of signal noise and baseline instability was significantly lower. It would be interesting to examine this from a cost-benefit perspective. Although prewired electrodes are faster and provide better recordings, they are also more expensive – would they pay for themselves with faster and better quality care? What initially made you interested in EM? Prior to medical school, I volunteered as an EMT, so that was my initial exposure. The initial triage, the acuity level, and the “rush” were things that were appealing to me. I kept an open mind and explored different options but I was always most interested in Emergency Medicine. EM felt like home. Why the UCONN EM program? A couple of things. Being from NY, it’s not that far. Patient volume, acuity level, and diversity are good. In the ER you see people from all walks of life. You see someone that is decently well off, and then you see a homeless person who needs help. You have social issues, and I don’t like that as much, but it adds to the complexity of the patient population. You see a lot of blunt and penetrating trauma at the program. With every EM, you get to deal with true emergencies and get a decent amount of that here. What do you like to do do outside of EM? Work out. Hang out with fellow residents. Go down to NY. Hang out with family and friends. Try to get as much sleep as possible. Do you think that having a life and EM are compatible? Definitely. We don’t do call. We do shift work, and during that shift, you’re doing a lot and running at 100% capacity during your 10 hours, but once you’re done, you’re done. That’s not like other areas of medicine where you have 24-hour call, but there’s some downtime. The patient load isn’t as high, although you go into a lot more detail with each patient. 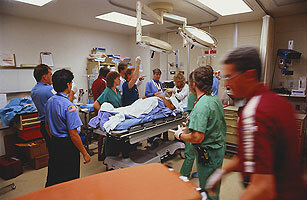 The nature of the ER is that you often only get the tip of the iceberg with the patient. That’s also the drawback of the ER- you CAN follow up, but you often don’t get to. EM makes for better compatibility between work and life. And besides- we are cool. What advice do you have for medical students who are interested in going into EM? Try to get the exposure. If you’re interested, make sure you’re interested. Do it because you like being there. You should like multitasking, efficiency. If you have problems doing more than 3-4 things at one time, then it might not necessarily be a good fit. Do something that will give you the exposure and find an advisor in the field, or do research in it. I think exposure is the key. Any tricks of the trade? Don’t bank on diagnostic imaging. If the history and physical really point to something, an X-ray is not necessarily going to rule it out. It can rule things in, but there are limitations to imaging. Same thing goes with labs. Always keep that in mind. Now available: the timetable for obtaining a residency in EM (this is the document that gets passed out every year at EMIG meetings). Accessible only to UCONN students. Ketamine is a well-established agent used for procedural sedation of children in the Emergency Department. However, ketamine recovery times can be lengthy and have been shown to range from 25-108 minutes. Recently, the use of propofol for procedural sedation has become more popular given its favorable pharmokinetics and adverse events profile. The disadvantage of propofol is the risk of dose-dependent respiratory depression. Is there a clinically significant decrease in total sedation time (10 minutes or more) when using ketamine plus propofol compared to the use of ketamine alone for pediatric procedural sedation? Secondarily, is there a significant difference in time to recovery, adverse events, efficacy, or satisfaction scores between ketamine plus propofol or ketamine alone? Blinded, randomized, controlled trial including 136 pediatric patients requiring procedural sedation for an isolated orthopedic injury. The use of ketamine plus propofol compared to the use of ketamine alone reduced the total sedation time by 3 minutes (p=0.04). In addition, ketamine plus propofol demonstrated a 10% reduction in vomiting compared to ketamine alone (95% CI -18% to -2%). Finally, satisfication scores were higher with the ketamine/propofol group (p<0.05). There was no statistical difference between the two groups with respect to efficacy or airway complications. The combination of ketamine plus propofol for procedural sedation only minimally reduces total sedation time (3 minutes) making it questionable as to whether or not this is clinically significant. However, ketamine plus propofol does decrease the incidence of vomiting and has a higher rate of satisfaction among patients, nurses, and physicians. It would be interesting to compare ketamine plus propofol to propofol alone for pediatric procedural sedation. HPI: 68 yo male with PMH hyperlipidemia and HTN presents to the ED with sudden onset of back pain beginning about 3 hours ago. Pain is severe and sharp. Associated lightheadedness, nausea and vomiting. Denies chest pain, urinary symptoms, constipation, diarrhea, fever, chills or problems breathing. PE: afebrile. BP 100/80 HR 105 remainder of vital signs within normal limits. ABD: soft, diffusely tender, pulsatile mass, +bruit. No evidence of scrotal hematoma or Cullen sign. Back: No CVA tenderness. No ecchymosis. Rectal: heme negative. Labs: CBC, Chem7, LFTs, PT/INR/PTT and lactate within normal limits. Urinalysis > 25 RBC’s, no evidence of infection. This is the University of Connecticut School of Medicine Emergency Medicine Interest Group [EMIG] website. It is built by students, for students who plan on a career in Emergency Medicine, or simply have an interest in the field. Current webmaster: Max Falkoff.